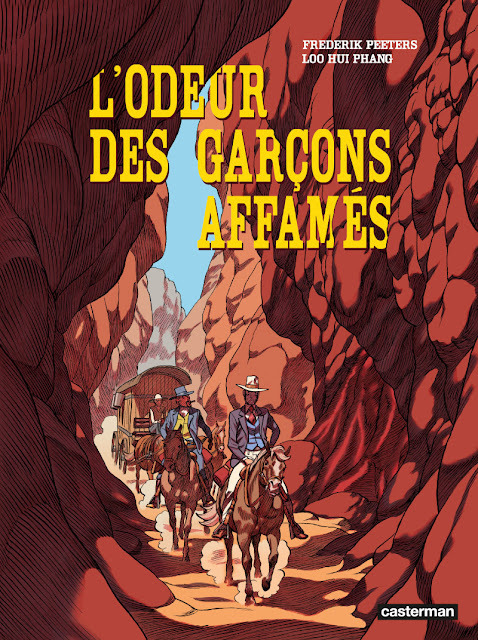 Some fantastic news to start the day: SelfMadeHero will be publishing an English-language edition of Frederik Peeters and Loo Hui Phang's L'Odeur Des Garcons Affames ('the smell of hungry boys'!) later this year. 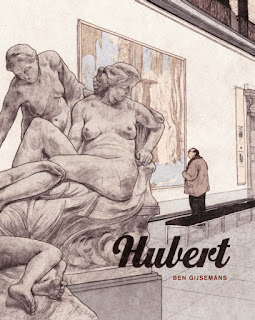 As you may recall, I've been following the conception of this book for a while, and was in Belgium last year when Casterman released it in French. The French volume was a beautiful, larger-than-A4 hardback affair (there was also a deluxe black-and-white version on offer), but I imagine that we'll get a slightly more scaled-down version. SelfMadeHero have a good relationship with Peeters, having translated the bulk of his previous works- Pachyderme, Sandcastle, etc., and generally do a great job on production; the 4-volume Aama, especially, was well designed in that regard. 'The Wild West. A mission drifting. A lurking man. All-powerful Indians. A mystery. And desire, immense, insolent. This will be my first introduction to French-Chinese-Vietnamese writer and director, Loo Hui Phang, and I'm interested to see the western she and Peeters have cooked up together. Set in Texas in 1872, the story follows photographer Oscar Forrest as he lists the landscapes of the west on behalf of geologist Stingley. 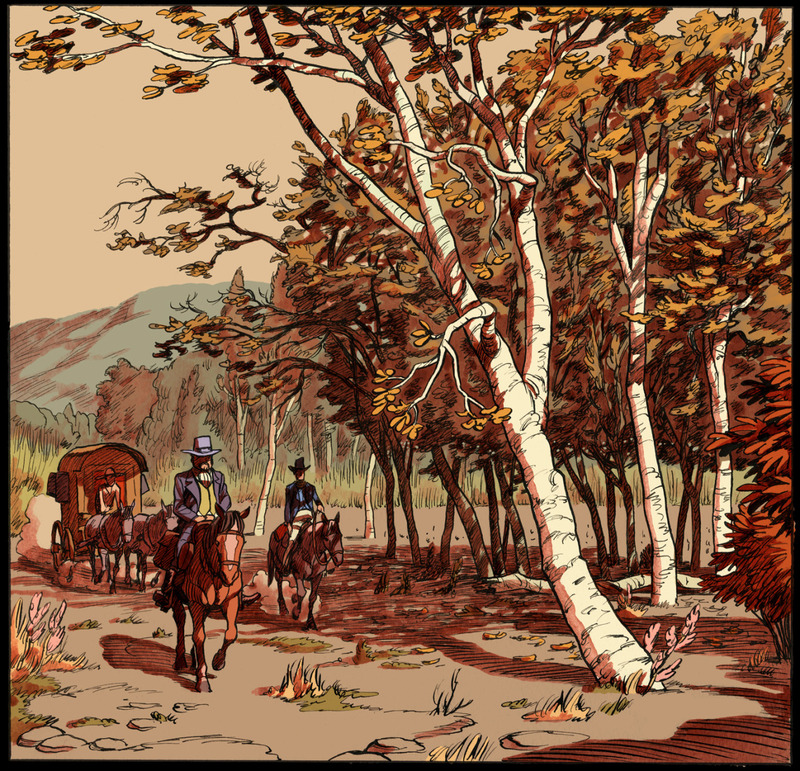 Prowling around the expedition are the disturbing figures of a man in black and a mute Indian. 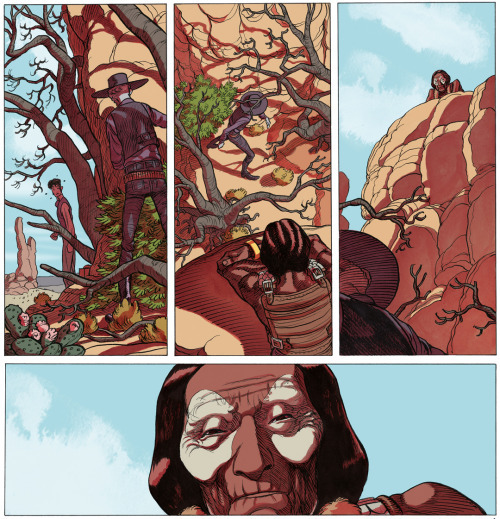 'As Stingley leads the mission to the gates of a hostile region, the last stronghold of resistance of the formidable Comanches, the boundaries between what is known and Nature's deepest secrets fades.' I've just been writing about the impending release of Herge's Peppy in the Wild West, a comic written in 1934 about anthropomorphic 'Indians' and 'enterprising' foreigners, and this book here perhaps illustrates the weakness of the 'product of its time' caveat. If Herge was ignorant and prejudiced in 1934, what excuse do people have today depicting mute, yet all-powerful Indians (!) and their savagery (a description included in French blurbs of the book)? I'd love to be wrong about it, and it's a stunning-looking book, but we can do much better.